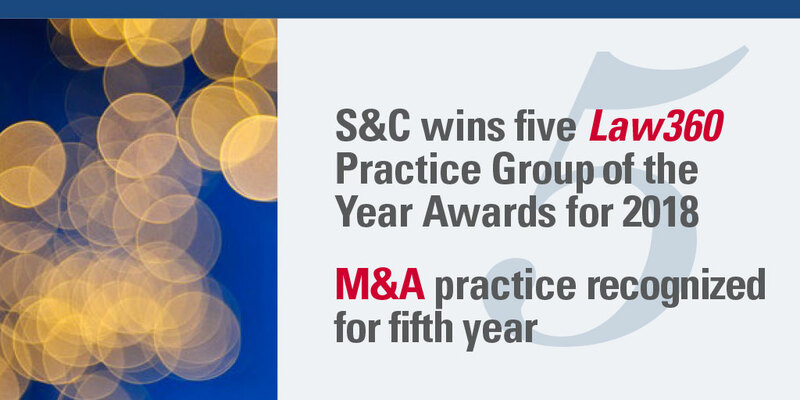 S&C Wins Five Law360 Practice Group Awards; M&A Practice Recognized for Fifth Year? Five S&C practices received Law360 2018 Practice Group of the Year awards, which honor “the law firms behind the litigation wins and major deals that resonated throughout the legal industry in the past year.” This is the fifth year that S&C’s M&A practice has received this award. These awards follow Law360’s recent announcement of its 2018 MVPs, which honored seven S&C individual partners: Patrick Brown in Banking, Robert Giuffra in Securities, Matt Hurd in Life Sciences, Nader Mousavi in Technology, Sharon Nelles in Transportation, Inosi Nyatta in Project Finance, and Marc Treviño in Benefits.